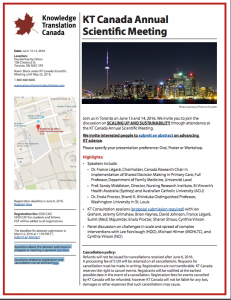 Join us in Toronto on June 13 and 14, 2016. We invite you to join the discussion on SCALING UP AND SUSTAINABILITY through attendance at the KT Canada Annual Scientific Meeting. We invite interested people to submit an abstract on advancing KT science. Please specify your presentation preference: Oral, Poster or Workshop. Questions related to registration and cancellation can be directed here.